Tubes were installed in Lake Palcacocha in 2011 to reduce water levels and help prevent major flooding. Huaraz, Peru–From a stone hut perched on the edge of the glacial lake Palcacocha, 14,980 feet above sea level, Juan Victor Morales radios down to a dispatcher in the city of Huaraz below. He is all that stands between the city and disaster. Today, it’s just a routine call, one the wind-chapped lookout makes every two hours during his fifteen day shift. Speaking into the handset of the CB radio, Morales reports the temperature, the amount of precipitation, and the level of the lake, then pauses to listen to the sound of a distant avalanche. “Don’t worry, that one is far away,” he says after the last echo of the avalanche’s rumble has faded out. He isn’t spooked: After all, there are avalanches here practically every day. David Garay, a glaciologist from INAIGEM recovers data from instruments installed in Lake Palcacocha. Morales is one of two men tasked with standing sentinel over Lake Palcacocha, which sits high in the Cordillera Blanca mountains east of the 120,000-strong city of Huaraz. His job is to warn the residents of Huaraz in the event of a glacial lake outburst flood—a sudden breach in the lake’s natural dam, which could be caused by large chunks of glacial ice from an avalanche falling into the lake. The displacement of water would create a wave that some University of Texas models predict could be as tall as 100 feet. Such a wave would easily smash through the moraine dam, an accumulation of rocks and sediment that forms along a glacier’s edge. Billions of gallons of water would rush down the valley into the city of Huaraz some 12 miles (20 km) away and 3,200 feet (1,000 meters) below, destroying everything in its path. It’s a problem threatening not only Huarez, but mountainous communities around the world. As global warming continues unchecked, alpine glaciers from the Andes to the Alps are melting at record speeds, creating a host of challenges for the people that depend on them for water, energy, and food. Now, NGOs and government officials are scrambling to shore up Huarez’s defenses while some residents are taking on big energy companies directly—a strategy which could serve as a template for similarly-threatened communities around the world. Just before dawn on December 13th, 1941 an avalanche sent large blocks of ice into Lake Palcacocha, creating waves that crashed through the moraine dam. The water that rushed out of the ever-increasing rupture poured into another lake called Jircacocha located just over a mile below, also destroying its dam. The combined contents of the two lakes then rushed into the town of Huaraz, appearing to the sleepy residents as a 50 to 100-foot high wall of water and ice, mud, rock, trees, houses, livestock, and human bodies that crashed through the city with unrelenting force. Up to 5000 people died and nearly a third of the city was destroyed in the glacial lake outburst flood of 1941. Today, it’s hard to imagine that such a disaster took place. Fueled by tourism, Huaraz has grown into the second largest city in the central Peruvian Andes—its population has quadrupled since 1941. The streets bustle with hikers, climbers, and other adventure seeking tourists from around the world. A host of businesses cater to them, offering everything from knock-off North Face jackets to roasted Guinea pig. Meanwhile, unseen in the mountains to the east of the city, Lake Palcacocha has also grown. Today the volume of the lake is 34 times greater than it was in 1941, according to national authorities, a ticking time bomb of 4.5 billion gallons of water. Lake levels rose so high in 2011 that authorities declared a state of emergency and installed flexible tubes to siphon water out of the lake. This emergency measure succeeded in lowering the lake by 20 feet (six meters), but many glaciologists believe that’s not nearly enough. After more than a decade of delay, the early defense warning system at Lake Palcacocha should be in place by the end of this year, but a reinforced dam is still years down the line. The $4 million dollar scheme to secure the lake has been slow moving, plagued by government corruption and bogged down by negotiations between competing interests, including national and regional governments, local communities, farmers, glaciologists, engineers, NGOs, and hydroelectric companies. Unable to just sit and watch from the sidelines, some, like local farmer and mountain guide Saul Luciano LLiuya, have taken matters into their own hands. In 2015, LLiuya sued Germany energy company RWE, one of the world’s largest producers of greenhouse gases. Although RWE has no presence in Peru, LLiuya argues that the energy giant has still played a major role in causing climate change and the loss of Peru’s glaciers. After a district court in Essen, Germany dismissed LLiuya’s case in December 2015, a higher court in Hamm agreed to hear it, making it the first time a company will be tried for climate change-related charges in Europe. The case is largely symbolic. LLiuya is only asking $20,000 dollars from RWE—an amount proportionate to the .05 percent of global CO2 emissions that the company is purportedly responsible for. If he wins, the money would go to the national government to be used for the lake securitization project currently underway. Even if he doesn’t win, LLiuya is happy that the case has brought international attention to the immediate threat climate change is posing to vulnerable communities not just in Peru, but in countries around the world. Scientists estimate that Andean glaciers have lost 1600 years of ice in the last 25 years alone, and in the Cordillera Blanca, Peru’s highest and most glaciated mountain range, glaciers have shrunk 35 percent in the past forty years, according to authorities. 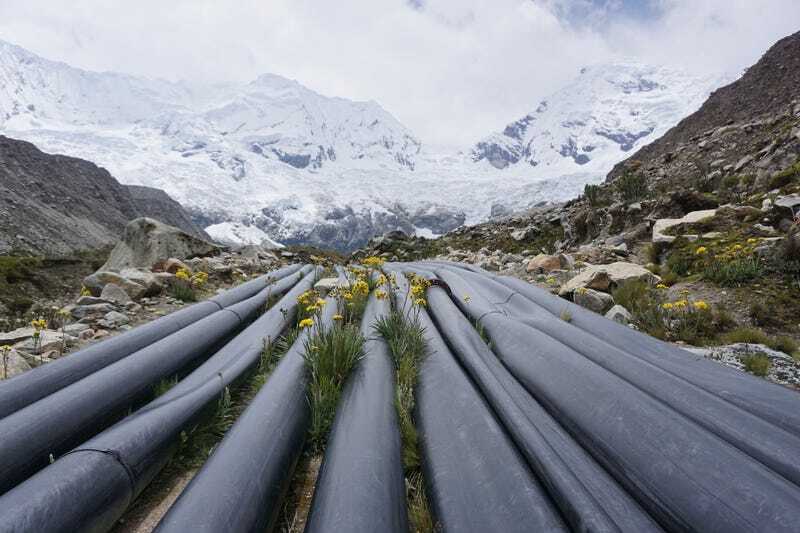 Beyond Huaraz, these glaciers supply water to the farms and cities in the desert lowlands. With that was supply today melting faster than it can be replenished, many experts fear shortages down the line. Those small signs, though, matter tremendously to front-lines communities like Huaraz. Looking out upon Palcacocha, Morales is hopeful that glacial experts will be able to divert disaster. The new early warning system is nearing installation, and preliminary studies for the dam are moving along. It’s a bright, sunny day, and the clouds sweeping over the mountains are unthreatening. You can see the snow capped peaks reflected in the azure waters of the lake. It is hard to believe something so beautiful could also be so deadly. “But who knows how much time we have,” Morales muses. He admits that he fears for the safety of his family and friends who live in the valley below. “Every day I see the glacier changing,” he says. “And it appears it is a problem around the world.